For the first time ever, environmental groups have staged a mass walkout of a U.N. climate summit. 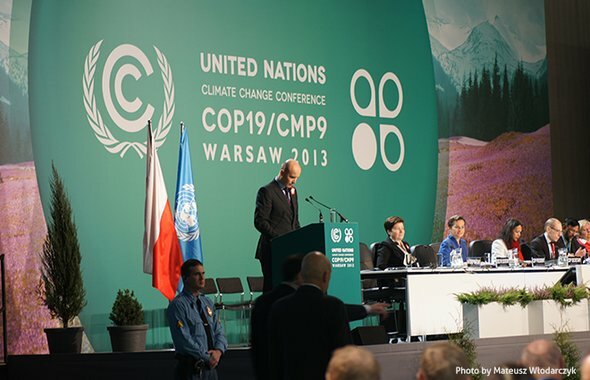 Citing immense frustration with the lack of productive action in the COP19 climate talks hundreds of people voluntarily withdrew from the talks. China’s Supreme People’s court said that using torture to extract confessions must be eliminated. "Inquisition by torture used to extract a confession, as well as the use of cold, hunger, drying, scorching, fatigue and other illegal methods to obtain confessions from the accused must be eliminated." Pope Francis called for renewal of the Roman Catholic Church and attacked unfettered capitalism as "a new tyranny". He urged global leaders to fight poverty and growing inequality. Climate change is causing the world’s oceans to acidify at rates not seen for the last 55 million years. The only way to moderate this danger is to reduce human emissions of carbon dioxide, conclude 540 scientists from 37 countries in a new report. While sea grass and some phytoplankton species seem able to cope with higher acidity, other organisms, such as corals and crustaceans are likely to be severely affected. Oil prices have fallen after Iran agreed a deal to curb some of its nuclear activities in return for an easing of international sanctions. Iran holds the world's fourth-largest oil reserves, but its exports have been hurt by the sanctions against it. Economics undergraduates at the University of Manchester have formed a Post-Crash Economics Society. According to the society academic departments are "ignoring the crisis" and that, by neglecting global developments and critics of the free market such as Keynes and Marx, the study of economics was "in danger of losing its broader relevance". Bolivian President Evo Morales announced that he will double the Christmas bonus for Bolivia’s public employees. Morales: “It is a fair recognition of the workers. The economy is in a good state and the workers should be rewarded for the country’s growth with a double Christmas bonus”. Neutrinos from beyond our solar system have been detected on Earth for the first time ever. The researchers involved say the discovery opens up a new area of astronomy. Only about half of the prescription drugs and other newly emerging contaminants in sewage are removed by treatment plants says a new report. The impact of most of these “chemicals of emerging concern” on the health of people and aquatic life remains unclear. What do people eat? These photos reveal the big differences around the world. Vancouver, Cape Town, and Abu Dhabi are the winners of the World Green Building Council’s Government Leadership Awards , which focused on global excellence in local green building policy. Doctors at University of Leuven recently report they’ve discovered a new ligament in the human knee. New body parts are discovered fairly often. In June scientists found a new eye layer, named Dua’s layer, that sits at the back of the cornea. A man who decided to offer ‘free hugs’ in Saudi Arabia’s capital Riyadh has been arrested by the state’s religious police. An undersea volcano has created a new Japanese island 620 miles south of Tokyo.